When: Saturday at 12:00 pm. Fifth-ranked Louisville Lacrosse is shaping up to be a heavy hitting contender in the NCAA tournament. In year two of ACC-play the Cards have proven that they belong in the nation’s best lacrosse conference. The Cardinals have a 12-1 overall record, 3-1 in the ACC. The Virginia Cavaliers, an ACC foe has an overall record of 7-6 yet is ranked 13th in the nation. This is the final home game of the season for one of Louisville’s most dominant athletic programs. Two Tewaarton Award (national player of the year) Watch list members lead Louisville, senior midfielder Kaylin Morissette and sophomore goalkeeper Britanny Read. Morissette leads the team with 46 points; she is second on the team with 31 goals and 15 assists. She along with a cast of four other seniors has led the Cards to their impressive record thus far. Read has started all 13 games in goal for the Cards this season. She has 100 saves; a .541 save percentage and the Cards goal differential this season is 154 goals to their opponents 85. When: Saturday at 1:00 p.m.
Bobby Petrino and his Cardinals football squad return to the field in preparation of the upcoming 2016 season in the annual Red & White Spring scrimmage. With the team split into two units fans get to see their gridiron warriors pinned against each other in an early glimpse of the season to come. After starting 0-3 last season the Cards finished with an 8-5 overall record and a 27-21 victory over Texas A&M in the Music City Bowl. The future of Louisville football emerged as freshman quarterback had a breakout season leading the Cardinals in both passing and rushing. The dual-threat quarterback threw for 1,840 yards and 12 touchdowns while rushing for 960 yards and 11 touchdowns. Jackson secured the starting job with his play at the end of the season and Cards anxiously wait to see him in his sophomore campaign. The Cards have returned the majority of last year’s team. A plethora of defensive stars including linebacker Keith Kelsey, safety Josh Harvey-Clemons and defensive end Devonte Fields decided to forgo the NFL draft and return to Louisville. Last year Kelsey led the Cards with 107 tackles, Harvey-Clemons was third on the team with 88 tackles while Fields led the team with 10.5 sacks and was fourth with 63 tackles. When: Friday at 10:00 a.m., Belmont University. Men’s tennis has felt the pains of competing in the nation’s best tennis conference with seven freshmen on the roster. The Cards are still looking for their first ACC victory of the season and only have those last two home ACC matches of the season to do so. Showcased on Senior Day against Wake Forest will be seniors Alex Gornet and Jeff Brown who were placed in the unique position of being seniors on a team dominated by nine underclassmen. Gornet has a 20-17 record this season while Brown has 14-13. Head coach Rex Ecarma never gives up on a season and is looking for a spark at the end of the season to see if his guys can’t make a run in the ACC Tournament. When: Saturday at 3:00 p.m.
Head Coach Sandy Pearsall’s softball squad was in the midst of a 12 game win streak before dropping two matches against the North Carolina Tar Heels. The Cards have an overall record of 24-8 with a 9-3 record in the ACC. Looking to get back to their winning ways it will start this weekend against North Carolina Central. The Cards are led by one of Louisville softball’s all-time great players, junior Maryssa Becker. A pitcher and home-run hitter Becker is a threat to the opposition at all times. She has started all 32 games this year and leads the Cards with 40 hits; she also has 10 doubles and six homeruns. In the pitching effort she has a 13-5 record, a 2.05 ERA and has 107 strikeouts on the season. Her understudy is proving to be just as dangerous. Freshman pitcher Megan Hensley is also an offensive and defensive threat. Hensley leads Louisville with 10 homeruns on the season and is just behind Becker with 38 hits. She has an 11-3 pitching record, an ERA of 2.40 and has 56 strikeouts on the season. The 1-2 punch of the upperclassman Becker and underclassman Hensley has Cards fans both excited for the future and the present. The Cards are looking to win their first ACC title and their play is giving them a chance as the season winds down. The Cardinals have wrapped up their indoor season and are moving to the outdoor competitions. In the ACC Indoor Championships the men finished ninth and the women finished eighth in the team events. Individual champions were junior shot put thrower Emmonnie Henderson who won the shot put title for the women. Ben Williams win the triple jump for the men while Louisville’s Damar Robinson came in third in the triple jump. Now that the Cards have moved to outdoor season this weekend is just one of a few chances Cards fans get to see their Track & Field team compete in Louisville. The Louisville invitational is just one of two events Louisville hosts in the outdoor season. Junior shot out thrower Henderson isn’t just working to defend her ACC title; she is working to get to the Rio Olympics this summer. One of the Cardinals with a real chance to be an Olympian every competition is do or die for Henderson and the Cards. When: Friday at 6:00 p.m.
Once again Dan McDonnell’s baseball squad is ranked in the top ten of the nation. With a 23-6 overall record, 9-4 ACC record, the Cards are looking for their second ACC title in as many years. Louisville is led by a deep bullpen of shutdown pitchers, solid fielding for defense and explosive hitters for offense. Junior pitcher Drew Harrington is having a breakout season with a 6-1 record and a 1.23 ERA. Sophomore Kade McClure has a 6-0 record with a 2.31 ERA. Sophomore pitcher Brendan McKay is a jack-of-all-trades. He has a 6-1 record, a 2.09 ERA and leads all pitchers with 65 strikeouts. McKay also starts at first base and is an explosive batter. He has a .938 fielding percentage and at the plate has 29 hits and three homeruns. The Cards have a cast of ten guys with at least 20 hits on the season. Four players have at least eight doubles, 35 hits and at least one home run. They are junior Nick Solak, Devin Hairston, Blake Tiberi and Corey Ray. Ray leads the Cards with nine homeruns and 37 RBI’s. As a team the Cards have 29 homeruns to their opponents 15, 247 runs to their opponents 83 and 225 RBI’s to their opponents 75. 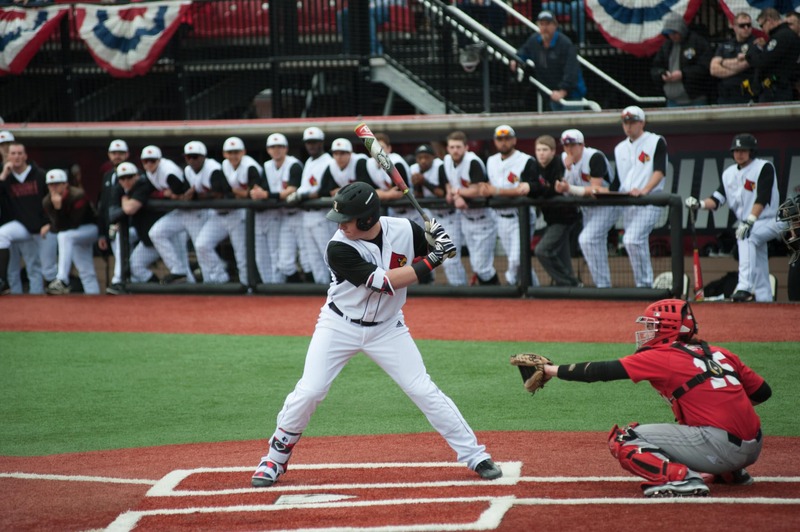 Possibly Louisville’s most consistent and dominant sports program, Louisville baseball is shaping up to have another deep run in the postseason.